This gives maximum flavor without cutting the salts potency with powder from other ingredients such as herbs or spices thanks to natural flavoring extracts. The same which quite often are found in the baking isle or any of the married found on Amazon. Everything from Bourbon to lime and rose can be used to easily infuse the salt with its concentrated flavor. After adding a few teaspoons of extract and mixing well, the salt is spread out into a thin layer on a plate and placed in a dry area. Putting it into a food processor can help remove any clumps. A great way to add smoky touch is with a tiny drop of liquid smoke... this is what I did with the chili pepper salt above. These salts require a deduction of the alcohol or espresso in a good heavy bottom pot until it turns into a syrup that's then blended with the salt. The drying process is the same as above. Since they make extracts of espresso and Bourbon, the avove can be an easier and quicker route. 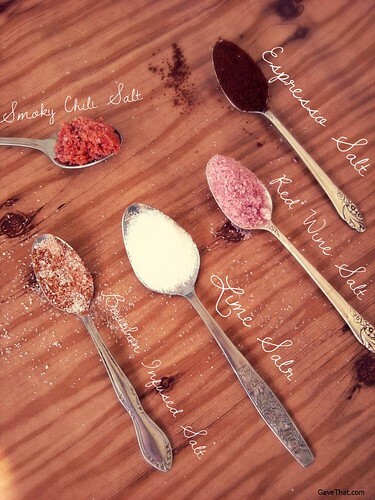 Another way, especially for the classic Fleur de Sel and Tahitian vanilla infused sea salt involves splitting a vanilla bean and mixing the paste with pure sea salt crystals. Store in a sack or give in a little tin and away you go. The same works with good paprika (and a drop of liquid smoke), ground chili peppers &/or other herbs such as celery seed. For how to wrap your salts up see this test tube way here and another inspired by Indian wedding gifts here.